Made in Australia, Oceania, 1997. 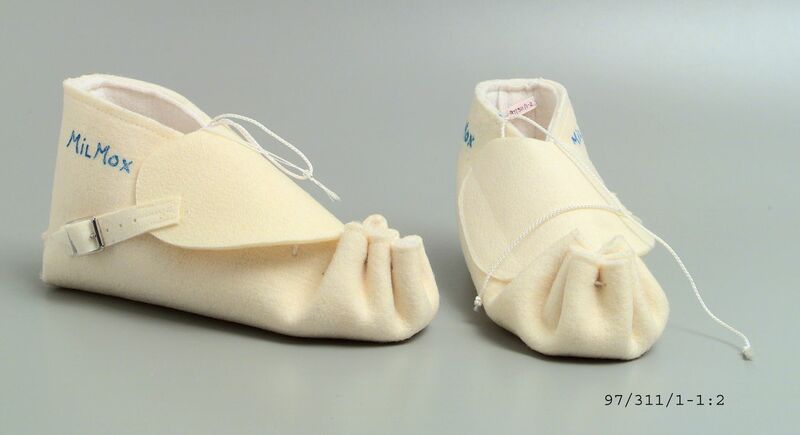 Pair of flat moccasins made of cream sythetic felted material. One seam at back, gathered at the top of the rounded toe. The shoes lace-up with white nylon cord laces through holes and this is covered over by a flap that fastens on the outer side of the shoe with a small metal buckle. The shoes are machine sewn and lined with white synthetic felt. Inscribed on each side of each moccasin in blue 'MILMOX', and on the back of each moccasin '9'. These moccasins were desinged by a travelling shearer based on a traditional design. Such moccasins were orignally made of soft leather. These moccasins were made by a travelling shearer in Australia. These moccasins were made in 1997. These mocassins would be used while shearing sheep. The flap over the top of the shoe prevents the shearer's feet from getting wet from sheep urine.